Biography - Dr. Haris Konstantinidis | Surgeon Thessaloniki. Dr H.D. Konstantinidis was born in Thessaloniki and graduated from high school with excellency. After succeeding national exams, he joined the Medical School of Aristotelian University of Thessaloniki (AUTH). He graduated with excellent academic performance. Afterwards he concluded his residency in the University Surgical Department of Hippocrateio General Hospital of Thessaloniki, obtaining the title of Surgery Specialty and just after his PhD in Medical School of AUTH. 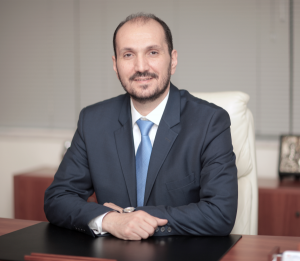 He has been specialised on Surgical Oncology, Laparoscopic and Robotic Surgery, Thoracic Surgery, while he was the establisher of the innovative surgical procedure that carries his name and is applied in Neurosurgery, concerning the treatment of hydrocephaly. He applies all the modern procedures of Minimally Invasive Surgery, with the intention to offer his patients the demanded surgical treatment with the less possible surgical trauma. This is achieved with the Laparoscopic, Thoracoscopic and Robotic techniques, also with the contribution of the Surgical Laser. Applying all international trends, he was the first to organize a robotics department of general surgery in Thessaloniki, winning both national and international recognition and and valuable co operations. Since then he has been the sole representative of robotic surgery and oncology in the field of general surgery in northern Greece. He keeps his private office in Thessaloniki, at 219 V. Olgas ave, associating with the largest private clinics of Thessaloniki. He devotes his personal time in being aware of every international innovation in the field of medicine, and also his family. He is an adorer of the greek countryside and tradition, while he has a special interest in water sports, having been for several years a national and Balkan champion in rowing.